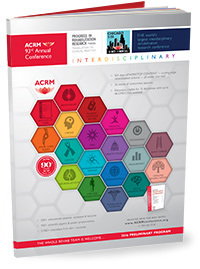 Offering 6 days and 2 concurrent tracks of high-caliber, educational content for rehabilitation technology, the ACRM 93rd Annual Conference, Progress in Rehabilitation Research (PIRR) has everything you need to stay on the cutting-edge. The Core Conference and Pre-Conference agendas below highlight all content with a DIRECT focus on Technology in rehabilitation. For specific REHAB TECHNOLOGY sessions and gobs of details (including presenters, session descriptions and schedules) see the ACRM APP, coming soon. 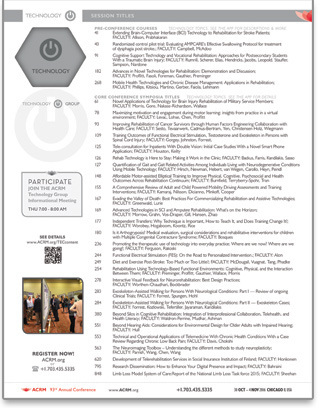 More than 60 hours of educational content focused on rehabilitation technology will be presented in Chicago. Search the APP for full details or see the Program at-a-glance. This is your chance to learn more about the new Technology Group and ways you might participate. Volunteer to develop and lead a task force or serve on the Executive Committee and help shape the future of this important group. All attendees are welcome.